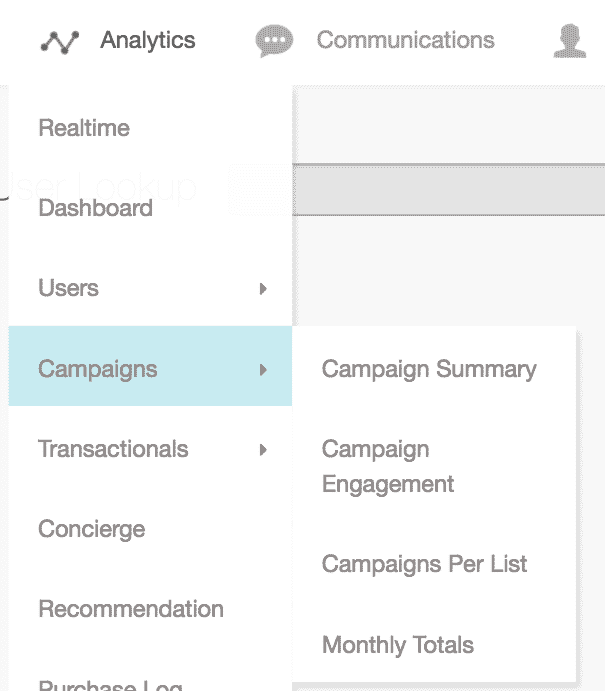 The reports in the Campaigns menu offer metrics that help you analyze the success and engagement of your campaigns across time and for various user segments. View aggregate and individual campaign-level data for your email campaigns. Use the dropdown menu to filter the displayed campaigns by List, Source Template, Day of Week, and campaign Label. Use the Start Date and End Date fields to set a date range. The filter also applies to the CSV export as well as aggregate data displayed by the Total row and the graph above the table. Use the Toggle Columns button to choose column headers in order to turn metrics on or off in your account. (See Campaign Summary Report Analytics Glossary below for a definition of all metric columns.) These selections are saved as a preference on your personal Sailthru account for all reports with configurable data columns. Click the Download CSV button to download the report, which only include the currently displayed columns as selected in the Toggle Columns dialog. Click the Bar Chart Icon for any campaign to view the Campaign Detail Report. Blast The name of the campaign message. Sent Number of users to who the list was sent. 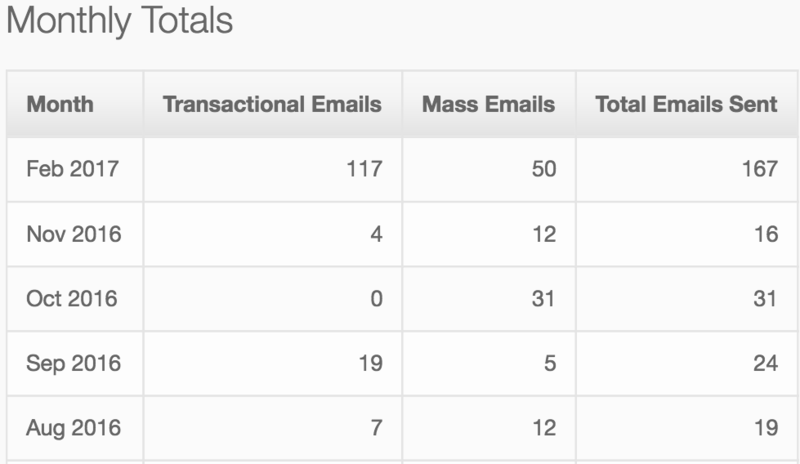 Delivered Percentage of emails sent that were sent, minus any hardbounces or softbounces. Beacons The number of users who opened the email with images turned on. Confirmed Opens Users who opened the email with images turned on, or clicked through the email with images turned off. Est Opens Confirmed Opens, plus the estimation of users who opened with images turned off but did not click. Total Beacons/M The number of total beacon impressions that were registered, including repeat opens, per thousand users messaged. Clicks Clicks from a single user. Clicks / Opens The click rate of confirmed openers, calculated as the number of users who clicked at least one link compared to the number of confirmed opens. Click Mult URLs Percentage of users who clicked on multiple links within one email message. Total Clicks/M The number of total clicks (including multiple clicks by the same user), per thousand users messaged. Purchases Purchase conversions as counted from individual (unique) users. Rev/M The amount of revenue generated by purchases from this campaign, per thousand users messaged. You must implement Purchase API for this data to appear. Hard Bounce A failed delivery of an email due to a permanent reason such as a non-existent address. Hardbounces are automatically removed from your valid list and will not be mailed to. Soft Bounce A report of a delivery problem or failed delivery. Among other reasons, messages may soft bounce at the server level, because of a resource exhaustion such as a full disc, or because of spam filters. A softbounced message may eventually be delivered and Sailthru makes redelivery attempts of softbounced messages. If you’d like to learn more about non-delivery messages and email protocol you can read more here. Opt Out Users who have chosen to not opt out of one or more lists. Opted out users will automatically be suppressed — not sent to — even if they are still on the list that you are mailing to. Spam Report The number of users who reported your email as spam and were automatically opted out. AOV Average Order Value is calculated by the total purchase revenue over the total number of purchases. Note, this does not include ad revenue. Total Sum of all campaigns in report. Send Start Time Time the campaign began sending, in your account’s local timezone. To get to the Campaign Detail Report, click on the Bar Chart icon on the Campaign Summary Report. Audience Builder has its own criteria based on the specific campaign. On the right of the screen is the All Campaign Recipients, which displays a summary of current stats. Click Recalculate Stats button to update the stats shown. Displays the number of clicks received by each static link (including those surrounding images). Those with no number displayed have not been clicked. Use the Show Dropdown menu to filter by Number (#) of Purchases generated after clicking through that link or Total Revenue driven from clickthrough of that link. Reports can be saved as a PDF. Provides breakdown of performance by users’ engagement level prior to send. For more information, see User Engagement Levels. Campaign-specific user activity grouped by users’ sign-up date. For natural lists, this is the date that the user was added to the list. For smart lists, this is the date the user profile was created. Campaign-specific user activity grouped by users’ email address domains, i.e. user@example.com. Only the top 20 domains are shown. Distribution of opens (beacon) and/or clicks over time. Your 200 best-performing URLs broken down by percentage of users who received that URL, its Click Rate, Total Clicks, and any Purchases and/or Revenue generated from users who clicked through that URL. The breakdown of engagement by various desktop, phone, and tablet devices, including only the top twenty devices. Campaign data broken down by Engagement Level. Use the dropdown menu to filter by List. Use the entry fields to set the Start Date and End Date. Click the Download CSV button to download the report. Engagement A chart of the engagement levels of your users. Sent The number of emails sent in a campaign mailing. This corresponds to the number of valid email addresses within the associated list. Est Open An estimate of the total number of users who have opened the email, regardless of whether they enabled images in their email client, allowing the beacon to load. 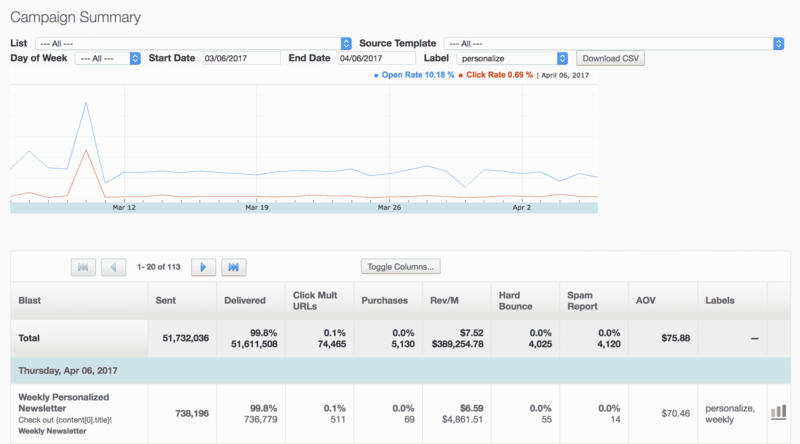 Click For users on the list, the percentage of campaign sends that result in at least one email click. Note that mass mailings typically have some number of undeliverable messages (bounces), so the percentage is typically higher when you compare clicks to your delivery rates, instead. Purch The number of users who went on to purchase. You must implement Purchase API call for this data to appear. Optout Users who have chosen to not opt out of one or more lists. Opted out users will automatically be suppressed — not sent to — even if they are still on the list that you are mailing to. Total The sum of all campaigns in the report. Engaged Users who have spent time browsing your website recently (within your Engagement Days window). To track Engaged users, you must have the Sailthru Personalization Engine script tag on your website, otherwise, data about site activity can not be collected and users cannot be listed as Engaged. Active Users who have recently clicked a link in one of your emails, but did not do any additional browsing on site. The window for recent activity is determined by your Engagement Days setting. Passive Users who have recently read one of your emails with images turned on, but have not clicked recently. New New users that are not associated with a specific list. Disengaged Users who opened or clicked your emails or visited your website in the past but have not done so recently, i.e. within your chosen engagement days window. Dormant Users who signed up prior to your chosen engagement days window but have never clicked or opened your emails. Optout/hardbounce Users who are no longer valid once they have opted out or hardbounced. Total number of campaigns sent to each list during the selected date range. Entry fields are provided to set the Start Date and End Date. Use the Interval dropdown to set the interval for daily, weekly or monthly. Click the Download CSV button to download the report. View your total sends by month for Transactional Emails, Mass Emails and Total Emails Sent.